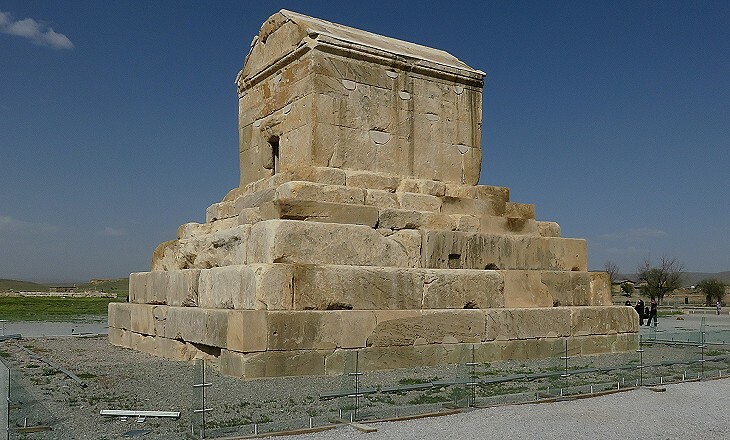 Pasargadae was founded by Cyrus the Great in the VIth century BC in the heart of Central Iran, the region from which he had started his conquests. The site chosen was a plain where he had defeated Astyages, his grandfather. The new town was therefore located in a difficult to defend position. The Citadel, a terrace built on a low hill, was perhaps more a high point from which the king attended ceremonies such as parades, than a fortification. 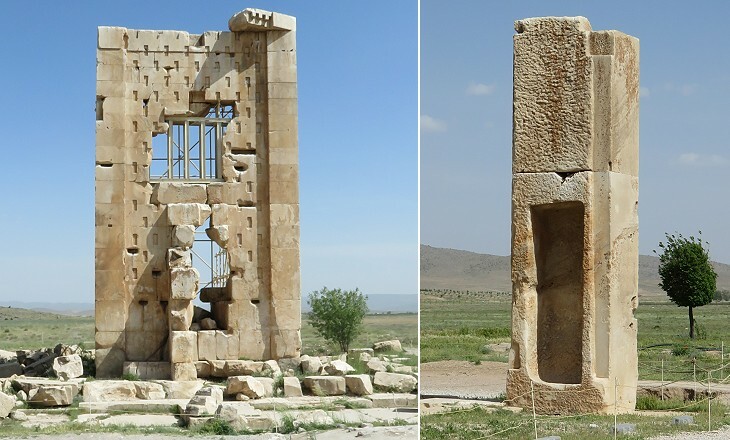 Most likely Cyrus did not fear that an enemy army could reach Pasargadae, because the Zagros Mountains separating Central Iran from Mesopotamia had only a very few passes which could be easily blocked. Pasargadae means "camp of Persia" and its buildings were spread over a vast area, similar to the tents of an actual camp. Archaeological reconstructions of the likely aspect of the royal quarter show pavilions within an elaborate garden with small ponds and bridges. The construction of the town was completed by Darius the Great, who however was not happy with its design as it did not suit the holding of large ceremonies. He therefore decided to build Persepolis, a new capital thirty miles south of Pasargadae. The Achaemenid kings made wide use of inscriptions to illustrate their achievements. Strangely enough they were written in small characters which could hardly be read from the ground and even placed in hidden positions (unlike those of the Romans). At that time the Persians used a cuneiform writing derived from the Babylonian one, but unlike the latter where entire words were represented by a symbol, each character meant a letter and words were separated by a slant sign. 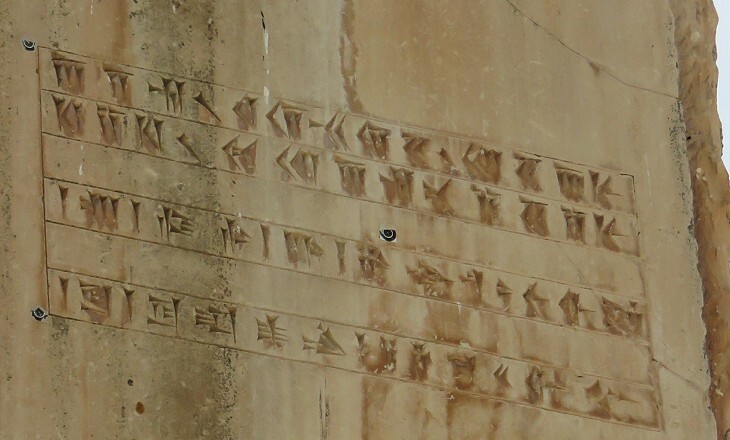 For this reason an old Persian inscription was longer than an identical one in Elamite or Babylonian. In 1838 old Persian was deciphered by Sir Henry Rawlinson by comparing a passage of a long inscription by Darius with a list of Persian kings by Herodotus. Eventually this discovery led to deciphering Babylonian and Elamite texts. 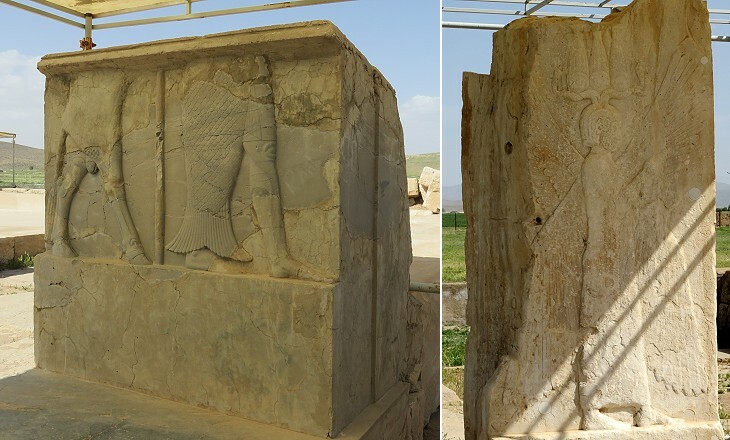 Reliefs played a major role in the decoration of Achaemenid monuments, but only a few of them have been found at Pasargadae. They were probably erased after Persia became a Muslim country, especially those representing human beings. The small gates of the palaces/pavilions were decorated with reliefs having an apotropaic purpose, i.e. to turn away harm or evil influences. 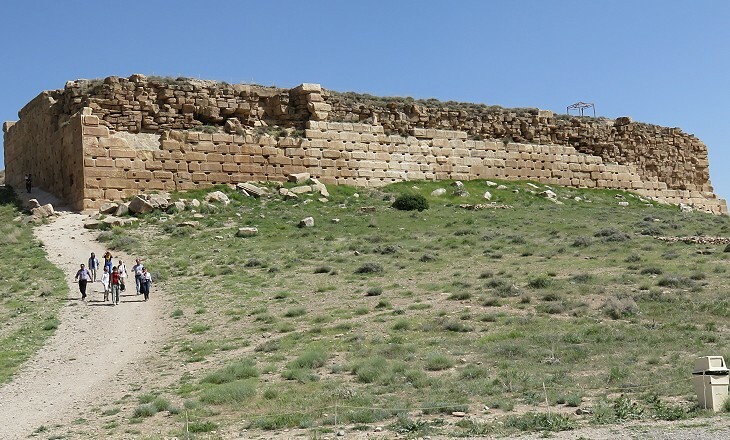 Archaeologists have found many links between these reliefs and those typical of the Assyrians, whose empire in Upper Mesopotamia lasted (with ups and downs) from the XXIst century BC to 602 BC. A newly planted avenue led to Cyrus's tomb, a sarcophagus of white marble on a high, stepped plinth, standing by itself among the ploughed fields, It looks its age: every stone has been separately kissed and every joint stroked hollow, as though by the action of the sea. No ornament or cry for notice disturbs its lonely serenity. Robert Byron - The Road to Oxiana - 1937 - Macmillan & Co.
Robert Byron visited Pasargadae in March 1934. At that time the monument was surrounded by Muslim graves (removed in the 1970s) and the mausoleum chamber had been turned into a small mosque. It was known as the Tomb of Solomon's Mother and this explains why it was spared from being used as a quarry as had occurred to the other buildings. The mausoleum was probably built by workmen from Lycia, a region in today's south-western Turkey, which was conquered by Cyrus and where similar tombs can be found, for example at Xanthos. In the XIXth century the plain around Pasargadae had the rather poetic name of Dasht-i Morghab (the plain of the water bird). 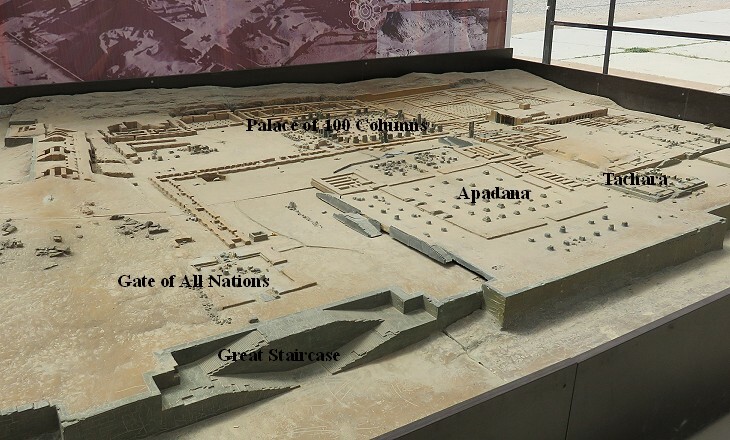 It was not until 1892 that Lord Curzon reached the conclusion that the ruins belonged to ancient Pasargadae. This was confirmed by the investigations of Ernst Herzfeld, a German archaeologist who conducted major excavations at Pasargadae and Persepolis in 1925-34. Persepolis and Pasargadae were "ceremonial" capitals, as their purpose was to impress delegations coming from the provinces of the empire or from vassal states with their magnificence. Darius in particular felt he had two reasons to build a new capital. One related to his obscure accession to the throne, as he was not the legitimate heir to Cambyses II, son of Cyrus and conqueror of Egypt. The second one related to the fact that the Achaemenid Empire included countries of very ancient civilization; their inhabitants regarded their new rulers as parvenus or barbarians. 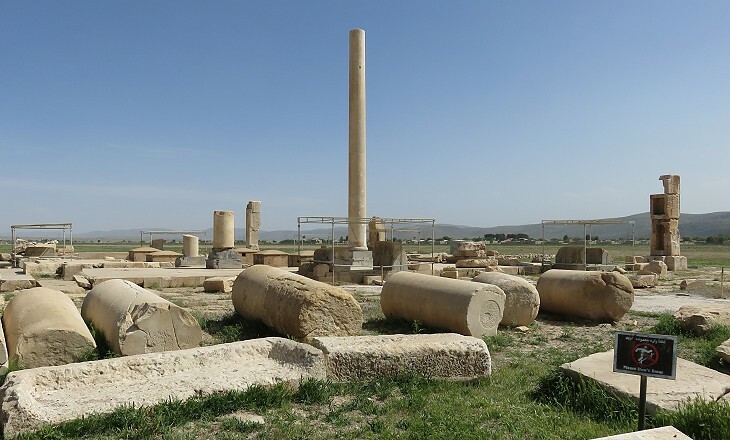 By replacing Pasargadae with Persepolis Darius lessened the link with Cyrus; by giving Persepolis a gigantic aspect Pasargadae did not have, he provided his empire with a monument which could withstand comparison with the Hanging Gardens of Babylon or the Pyramids of Egypt. The complex of buildings where ceremonies were held stood on an impressive terrace in part cut into a hill and in part supported by walls. This made the monuments of Persepolis visible from a great distance. A double staircase with very low steps was designed to facilitate the access to the terrace by processions such as those accompanying the king upon his return from a successful campaign. The low steps made the ascension necessarily slow, thus increasing its solemnity (you may wish to see a similar staircase at a shrine at Palestrina). 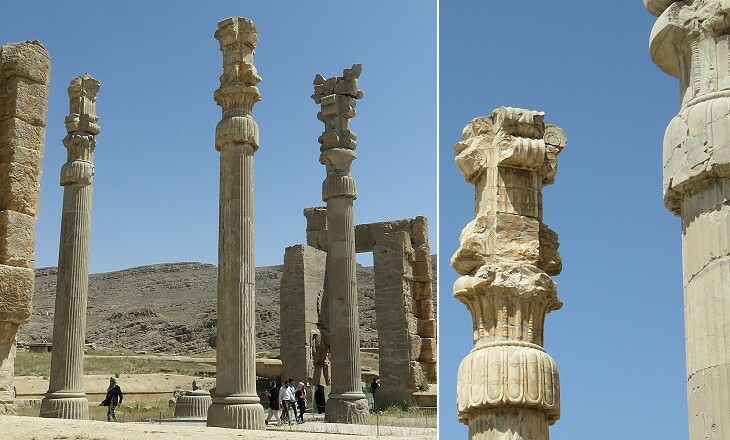 The construction of Persepolis was completed by Xerxes, son of Darius and of Atossa, a daughter of Cyrus, whom Darius married after his accession to the throne, to strengthen its legitimacy. Xerxes followed the same approach as his father on an even larger scale. He built a grand gate where processions entered after having ascended the Great Staircase. It was meant as a monument to the many nations which were part of the empire. 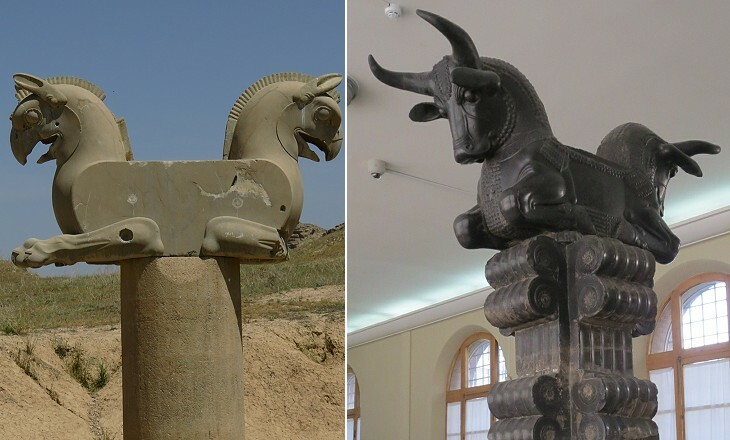 The lamassu (winged bulls with human face) placed at the sides of the two entrances were a tribute to the Assyrians and to Mesopotamia, the most fertile province of the empire. The capitals of the columns between the two entrances have a very complex design. Their lower parts have the shape of a reversed lotus flower, a symbol of Egypt. The upper parts have spiral scrolls, typical of Ionic capitals (see a capital at Priene, a town of Ionia). Darius and Xerxes were very proud of having conquered this region on the eastern shores of the Aegean Seas. Their attempts to conquer the western shores of that sea (i.e. Classic Greece) failed at Marathon (First Persian Invasion 490 BC) and Salamis (Second Persian Invasion 480 BC). The double-protome* capital is typical of Achaemenid architecture and in particular of the monuments of Persepolis and Susa. It was almost ignored in Greece, apart from a few cases such as the decoration of a temple on Thassos. * frontal view of an animal head or bust of a human. 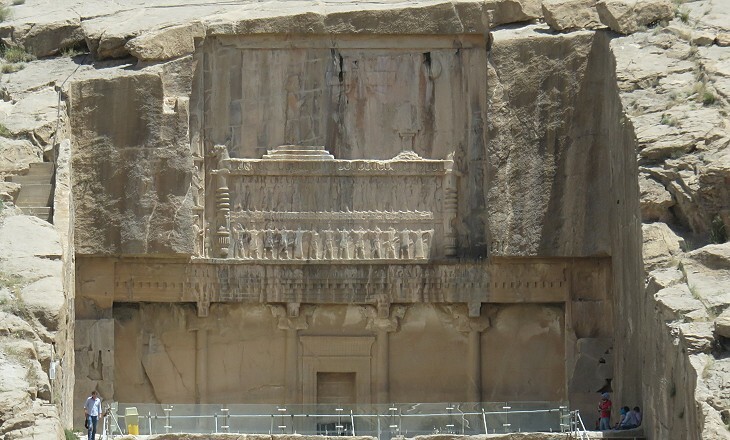 Xerxes completed the construction of Persepolis, including a palace for himself. During his kingdom however the importance of the city declined in favour of Susa which was located in Mesopotamia, in a more central position when considering the whole Persian Empire. 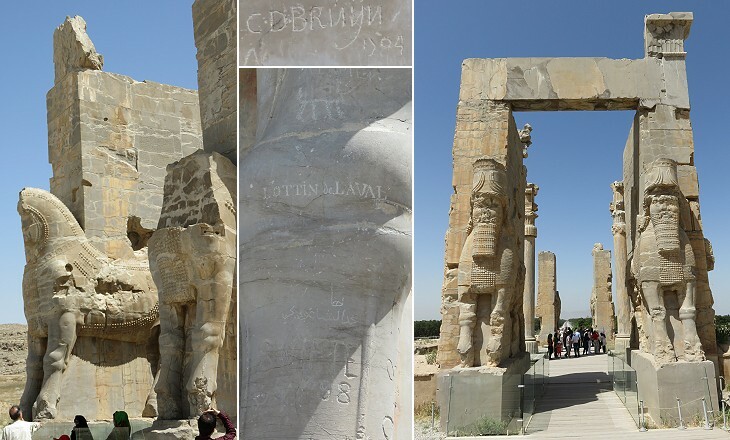 His successors did not add much to the monuments of Persepolis, but the city continued to be seen as the cradle of the Achaemenid dynasty and many kings chose to be buried next to Darius in tombs cut into a rock near Persepolis. 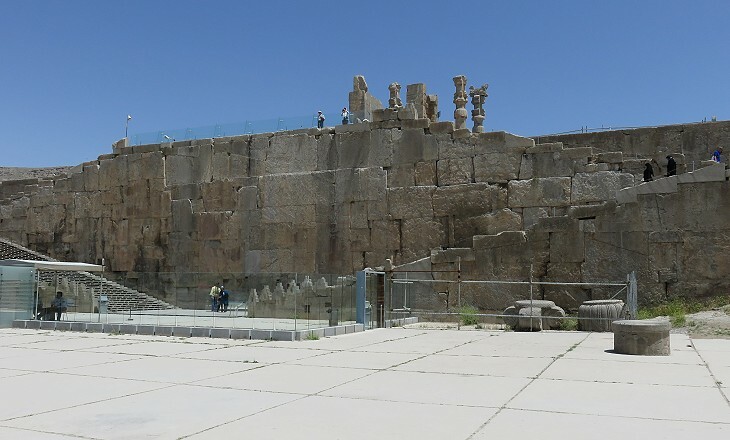 Artaxerxes II and his son Artaxerxes III (IVth century BC) chose to have their tombs right above the terrace of Persepolis. The image used as background for this page shows a statue portraying a lamassu (National Museum of Tehran).